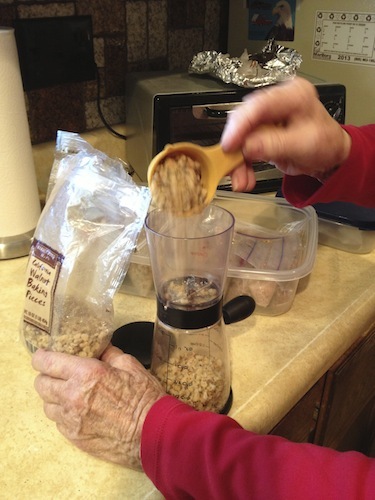 Just in time for the holidays Loretta showed me how she makes her pecan cheese ball. She uses walnuts instead of pecans, she explains, because they are cheaper and were more abundant when she moved from Wisconsin to California. Loretta’s recipe uses Old English Cheese Spread, a processed cheese that comes in the kind of jar that my mom saved and used for kid-sized servings of orange juice at breakfast. The beauty of this recipe is that it is simple and can be adapted to your own taste. Basically you use softened cream cheese and either cheese spread or grated cheese. Loretta’s recipe uses onion and garlic powder for seasoning. Mix together, wrap in foil and chill while you chop the nuts of your choice. Then mold the mixture into a ball and roll in the nuts. Clean the foil and put it back around the ball and store in the refrigerator. Serve with crackers. When asked to contribute a lower calorie recipe using Garlic Gold® Nuggets (a toasted organic garlic condiment) to be posted as one of their holiday recipes, I immediately thought of ways to adapt Loretta’s simple recipe. You can see the result in my opening photo. Very popular at our house this season. Put cream cheese and grated cheese into a food processor with Garlic Gold® Nuggets. Process to mix. Then chill mixture for 1 hour. Roll into one large ball or several smaller balls. 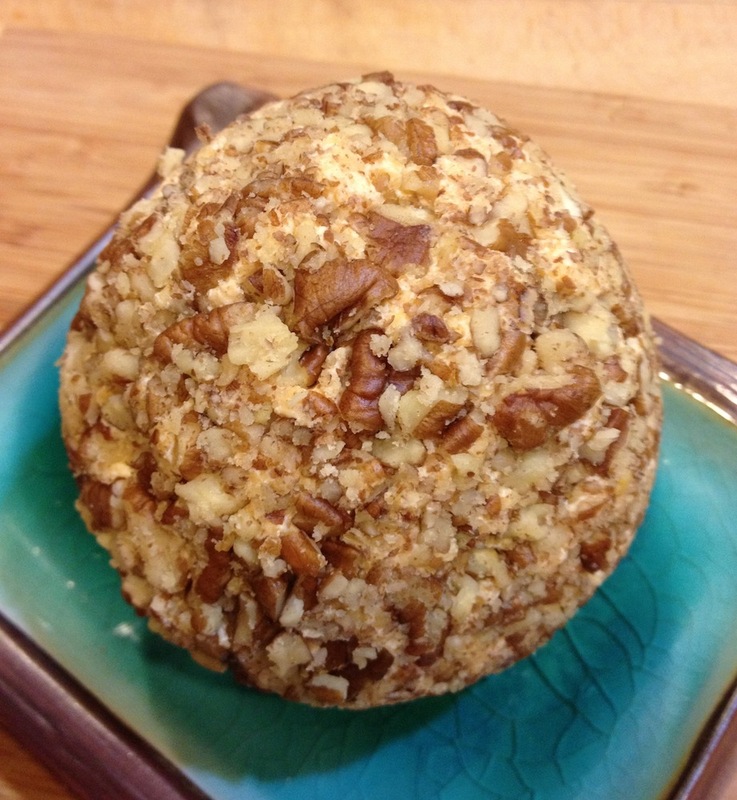 Roll balls in chopped pecans. Mix fresh herbs, chili, or grated lemon rind into cheese mixture. Form into log or disk rather than ball. Drain carton of non-fat yogurt through coffee filter in refrigerator until it becomes as thick as cream cheese and use in place of cream cheese.